I usually know almost everything about a book or a film before I sit down to enjoy it. Word of mouth, reviews online and even the blurb can give away so much of the content that you can sometimes predict exactly how the story is going to go. I recently watched ‘What Maisie Knew’ without knowing anything about it. It was one of the best films I have seen in a long time, it was moving and sensitively shot from the child’s perspective. Without knowing anything about the story I was riveted to the screen and I really connected with the characters. The same thing happened when I picked up a book that a friend had left for me to read. She hadn’t mentioned what the book was about and the blurb didn’t really give anything away. Within the first few sentences I was hooked and I couldn’t put it down. I often thought of the times I had been looking for something to read and had picked it up and put it back on the shelf. In a way, that can be a good metaphor for life. Sometimes I feel I’m too scared to try the unknown until I have read enough reviews, or too scared to go anywhere new until I have mapped out the entire route. I rely too much on second hand knowledge, until I forget how to trust my instincts. 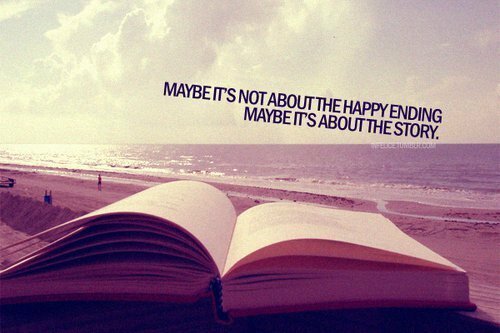 I need to stop trying to second guess the ending and just enjoy the story!